Grammar School Records was established in Rye in 1991 and is one of the leading independent record shops in the U.K. 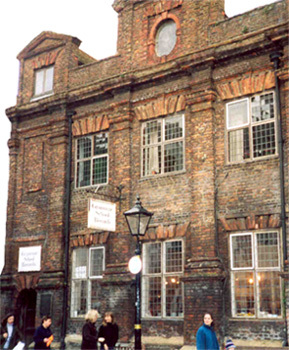 Situated in the historic Thomas Peacocke grammar school building, built in 1636, it is a unique setting for a record shop. Rye, with a population of 5,000, is one of Britain’s finest medieval towns and a favourite with tourists from around the world. There is ample parking in the town, with some free parking outside Grammar School Records in Rye high street. The shop is open seven days a week from 10 to 5.30 Monday to Saturday and from 11 to 5.30 on Sundays. We currently have some 20,000 LPs in stock, covering Rock & Pop, Jazz, Folk, Blues, Reggae, Easy Listening, World Music, Comedy, Classical, Spoken Word, Musicals and Soundtracks. In addition, we have 20,000 7inch singles as well as substantial CD and cassette sections, not forgetting the largest selection of 8-track cartridges in the country! We are currently in the process of listing collectible records on this site. If you do not see what you are looking for, please ask. Links: You might wish to visit our sister company, Backtrack, with the largest selection of soundtracks in the country on LP and CD at www.backtrackrye.com. © 2004-2015 Grammar School Records.